Try free software system from the most called for catalogues! Get called for software package and rare applications programs. acquire commercial utilities, public domain software, free programs, and demo to obtain in several classes. On Softempire collections you may always obtain new apps, or recieve the hottest editions of your most desired PC and mobile tools, utilities, and relax softwares. To find the required applications to recieve, try a suitable catalog or a smart search engine. The Softempire aggregation is at once filled up: if there is the hottest variation of computer software you seek, it is likely to be in the internet ultimate software program catalogue! Scrap paper-based exams for secure online testing! Adit Testdesk makes distributed network-based testing easy and secure. No matter how many students or test subjects you have, the client-server edition of the Adit Testdesk suite will fully replace paper-based tests with fully automated, computer-graded exams. The comprehensive testing suite makes it easy to design, run and grade tests, exams, and surveys. Multiple question types from multiple choice to Flash animations to spoken response are supported. Secured client-server technology makes network-based tests bullet-proof to protect students' privacy and prevent tampering. No answers or grading rules are ever stored on workstations running the tests. Answers to test questions are transferred onto the server protected with secure encryption algorithms. The server is responsible for grading the tests and assessing the results. You won't need Adit Testdesk installed on every workstation. A simple self-contained client application is all that you need to perform local and network-based tests. Adit Testdesk makes distributed online tests as easy as in-class exams. No matter whether you conduct a test in a LAN-connected classroom or over the Internet, exams remain just as secure as they ever were. Access to each test or exam can be restricted with a variety of rules, location and user-based quotas. 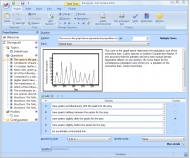 Adit Testdesk closely mimics the appearance of Microsoft Office 2007, making the testing suite easy to learn and to use. Adit Testdesk can produce exams that look just the way you like, including custom logotypes, fonts, and background images. Fully customizable reports are available. Exams produces with Adit Testdesk look similar to familiar paper-based tests. Common question types such as multiple choice, fill the blank, draw and connect, true or false and many more are supported. Additional question types unique to computer-based testing are also available, including spoken response, Flash animations, video and audio. Pass Your e20-001 Exam with 100% Guaranteed at first attempt today with CertifyMe.CertifyMe is known for its High Quality product and 100% Pass Guaranteed or Full Refund. Download free MB2-876 questions and answers. MB2-876 exam questions are ultimate solution for your certification. All MB2-876 exam materials are with money back guarantee. Download free demo.